Home > > Uncategorized > Carpenter Brothers Celebrate 100 Years! This year, Carpenter Brothers, Inc. (Mequon, WI) is proudly celebrating its 100th anniversary in the foundry and metalcasting industry. Founded in 1917 in Milwaukee by brothers Everett and Milton Carpenter with a sum of $410, the company has grown significantly from its humble beginnings. The 100 years of Carpenter Brothers’ continuing success is attributed to the high-level expertise on specific foundry processes and products and the technical and manufacturing knowledge of its sales and customer service personnel. The business was first known as the Foundryman’s Supply Company, which the Carpenter brothers were hired to manage in 1917 prior to enlisting in the army during World War I. Upon their return from Europe a year later, the brothers incorporated the company and officially renamed it as Carpenter Brothers, Inc. in 1921 with Everett serving as secretary-treasurer and Milton as President. Milton Carpenter served as the company’s first president until 1942 and was succeeded by his brother after his death. In 1968, Bradley Booth took over the position. In 1963, Everett Carpenter’s son, John, joined the company and took over as President and CEO upon Booth’s retirement in 1979; John Carpenter remains board chairman today. Hired in 1983, Mike Morrison succeeded John Carpenter in 2010. Most recently, Nicholas Gerrits became CEO and President in 2016. Now headquartered in Mequon, Wisconsin, ten miles north of Milwaukee, the company holds offices throughout the Midwest and the U.S. with two dozen technical sales representatives, engineers and geologist representing its services. Carpenter Brothers, Inc. is a dealer, distributor and representative for manufacturers of industrial supplies and equipment. Though foundry supplies and equipment have been and still make up most products and sales, diversification has added products and services for the die casting, environmental, blast cleaning and surface finishing industries. 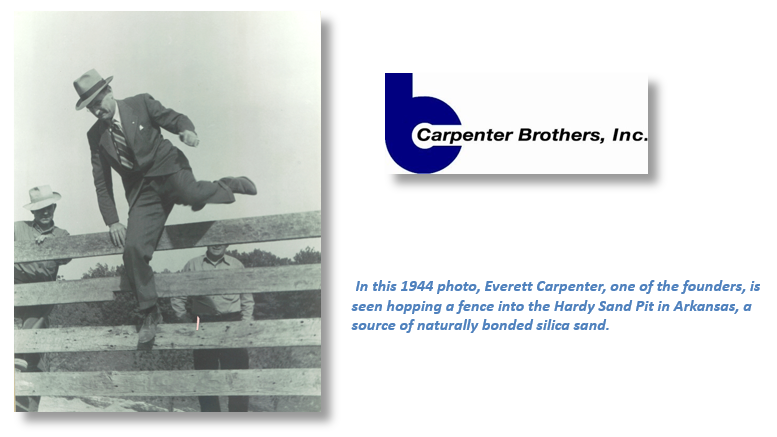 As Carpenter Brothers, Inc. celebrates 100 years in the industry, the team looks forward to another century of success.